July is going to see some great food events in Kitchener and Waterloo! Be sure to check these out and come visit us to get your kimchi fix! Food truck season is off to a great start! Thank you to all of our great friends in Kitchener-Waterloo who have made things kick off with such success! We are excited to be attending some great local events so be sure to check out our schedule page for details! We are posting our weekly schedule for lunches as well, however please note that twitter and facebook are the best places to check for exact locations as uptown locations can only be secured the day of. We are looking forward to our first full season this year and are excited to be participating in some "top notch" events! We are thrilled to be working with such a high caliber of food truckers, chefs and restaurateurs! Check out our Schedule page for updates of where we will be on weekends this spring and summer! 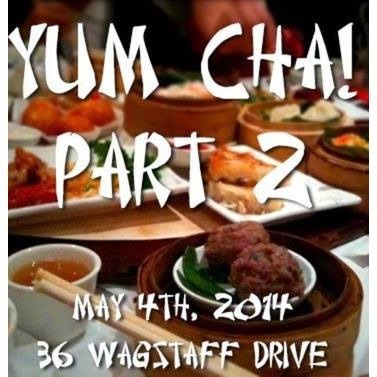 In May we are serving up dim sum with Left Field Brewery in Toronto, joining food truck pioneers in Hamilton, celebrating food trucks and wine at Peller Estates and collaborating with some of our favourite restaurants like Cheeses Murphy! 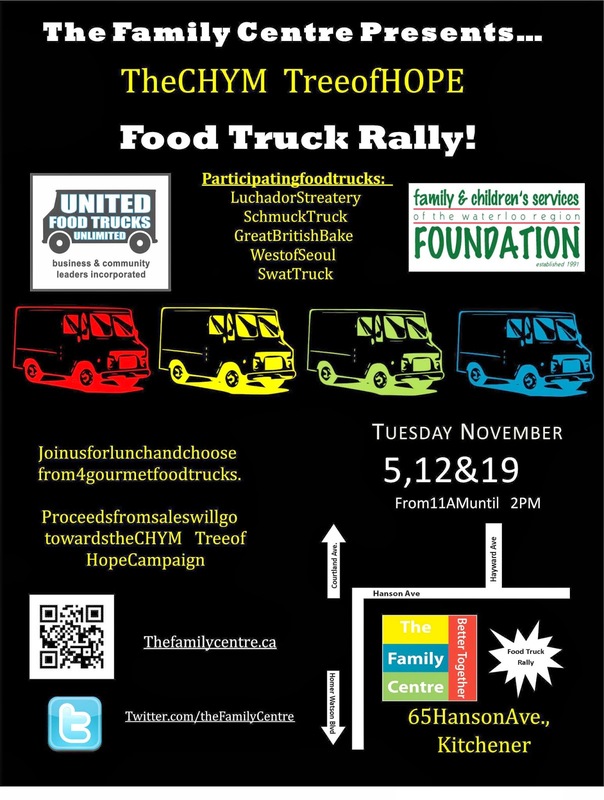 We will be starting our daily curbside lunch service again this season in mid May as we are waiting to hear council's decisions on by law policies in both Kitchener and Waterloo on April 28th. Once the new bylaw legislation is in effect we will notify our followers of our daily lunch locations. See you on the streets! SOLD OUT!!!!! Send us an e-mail at westofseoul@gmail.com to be on our waiting list and to be included on our mailing list for future events. 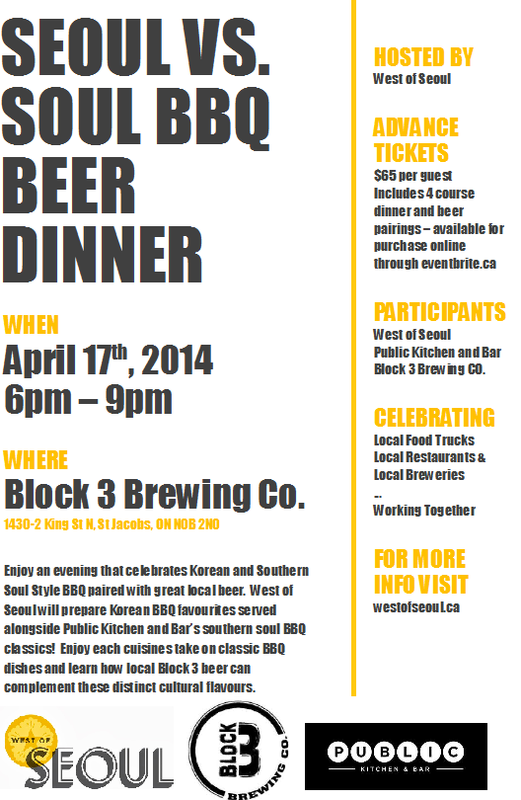 Owner/Operator of West of Seoul food truck Christopher Kim shares his love for BBQ with Owner/Head Chef of Public Kitchen and Bar Ryan Murphy, so we created an event to showcase some of their favourite dishes paired with some amazing beer from Block Three Brewing! Enjoy each course that features classic BBQ dishes as Chris prepares the Korean BBQ version with Ryan's Southern Soul BBQ version. Block 3 Brewing is an amazing local brewery in St. Jacobs and not only will you get to enjoy the ambience of their great brewery while tasting their different beers, but you will have the opportunity to learn more about the inspiration behind their products and craft. Join us with our friends from The Culinary Studio on March 26th from 6 - 9 p.m. for an interactive Korean cooking class! Owner/Operator Chris Kim will be guiding you through making your own kimchi to take home along with a West of Seoul style menu, including Korean ribs, Chap Chae and Chris's personal favourite at home - Kimchi fried rice! Limited spaces are available! Click here for more information and to sign up! Happy to be Apart of Another Great Fundraiser! Come and help us raise money on November 5th and 19th for The Family Centre! Come and visit West of Seoul right beside town square on Willis Way on Fridays and enjoy our weekly fried chicken special! Don't worry, we will have our healthier options as well along with our sweet treats! Another exciting Friday feature that we will be doing is our Kimchi Shop! We have had an overwhelming amount of requests for Kimchi so we will now be selling our signature house made Kimchi all Friday lunch and afternoon on a first come, first serve basis. 500 ml containers can be purchased for $6 and 1 ltr containers for $11. Come out and celebrate the end of your week with us and we will see you on the streets! Tweet it, then Eat it! West of Seoul. Simple theme. Powered by Blogger.